The dust has settled on the trade deadline, and the Penguins wisely decided not to be too active in the trade market, with their only major move being acquiring Justin Schultz from Edmonton for a 3rd round pick. Part of the reason to pump the breaks is tonight's opponent, the Washington Capitals, who have built an 11 point lead over the Chicago Blackhawks in the race for the Presidents' Trophy. The teams will be making up the game originally scheduled for January 24 before being cancelled due to blizzard that hit the DC area. It's the second game of a back-to-back that kicks off a busy schedule for the Penguins that sees them play 5 games in the next 7 days and 9 of their next 10 against the Metropolitan Division. This will be the third game of 5 on the season between the two teams, and they've split the first two games, with the Penguins winning 3-1 in October and the Capitals 4-1 in Mike Sullivan's first game behind the Pittsburgh bench. Alexander Ovechkin quickly established himself as the premier goal scorer in the league when he entered the league after the lockout, and after a couple season stretch where he fell below expectations he's right back as the premier goal scorer in the league after winning the Rocket Richard Trophy the previous 3 seasons. He's again atop the NHL this season with 40 goals through 59 games played. For most players, it would be a career best scoring rate by far, but for Ovechkin it's a pace that would give him just another 50 goal season - his 7th if he makes it and his 6th Rocket Richard if he maintains his lead. If it wasn't for a surprisingly low 18 assists that has kept him in 10th place in the scoring race he'd likely be running away with the Hart Trophy given the dominance of the Capitals. It's also a point total that keeps him out of the team lead for scoring as well. Fellow Russian Evgeny Kuznetsov leads Washington, and is 5th in the league, with 64 points. 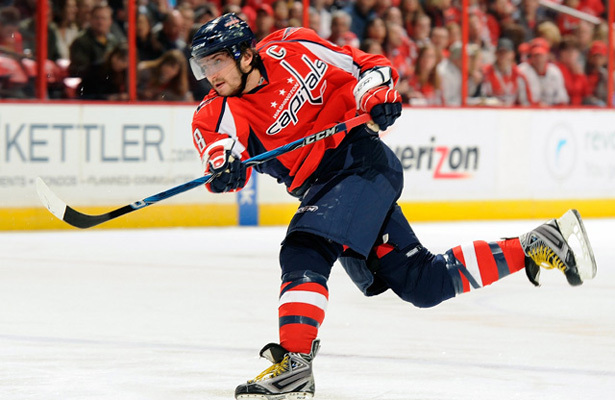 It's a breakout season for the 23-year-old winger in his 3rd season in the league, and he's proved to be well worth the wait for the Capitals after he remained in the KHL for 3 more seasons after Washington drafted him in the 1st round in 2010. But there is no shortage of strong offensive seasons for the team leading the NHL in scoring with 3.26 goals/gm. Nicklas Backstrom also finds himself just behind Ovechkin in 11th place in the league with 57 points. In all, Washington has 7 players with 15 or more goals on the season, including newcomer Justin Wiliams. The former Conn Smythe Trophy winner has built a reputation on being a great playoff performer, and he's helped the Capitals become runaway favorites to win the Presidents' Trophy in his first year with the team with 19 goals and 24 assists. - The Penguins currently have 3 goalies on the NHL roster after calling up Matt Murray Saturday evening, and GM Jim Rutherford announced that they plan to keep all 3 in Pittsburgh and splits starts among them all, with Fleury getting the starter's share.